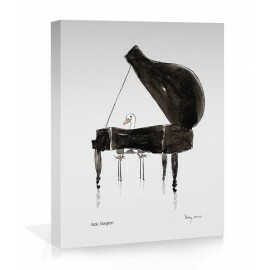 All of Perry's drawing can be printed onto canvas. Please contact us via the 'contact' button on top of the page with your choice, as these prints are made to order. Canvas printing of art is done on linen material, using state-of-the-art inkjet printing technology, which allows clarity of images, colour depth and an excellent overall visual performance. In addition, all prints are stretched on a wooden frame. Hanging hooks and cord are supplied. Printing, stretching and dispatching normally completed within ten working days. 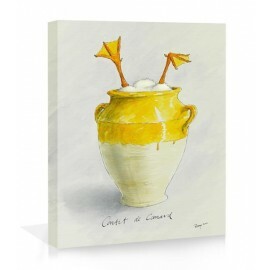 Canvas prints There are 4 products. 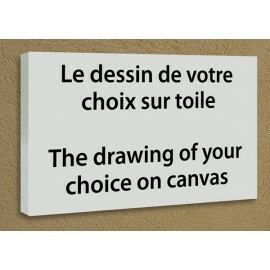 The drawing of your choice printed on canvas. 100 cm x 75 cm. Include the name of the drawing in the text field at the bottom of the page and click 'register' before adding to basket. 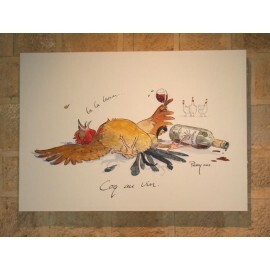 Large format canvas print of Coq au Vin 100 cm x 70 cm, already stretched on a frame. Hanging hooks or cord not supplied. Confit de canard imprimé sur Toile, sur chassis. 100 cm x 75 cm. Système d'accrochage inclus. 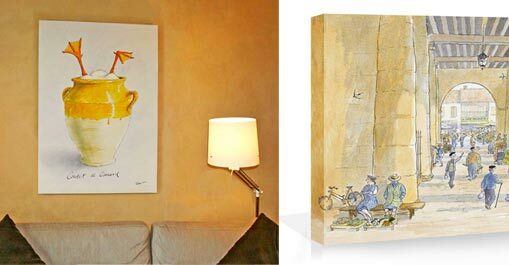 Canvas print of Duck Ellington Large format 100 cm x 75 cm, already stretched on a frame. Hanging hooks and cord supplied.